It’s time to reveal the BAM8 t-shirt design! Designed by our own Kenneth Chan and concept by Daniel Chlebowczyk from the CouchWarriors Committee. Super Street Fighter II Turbo, Virtua Fighter 5: Final Showdown and Ultimate Marvel vs. Capcom 3. Sign up now or add the games if you’ve already pre-registered! Big thanks to SpiderCarnage and Jake Lovett aka Naked Jake for running Super Turbo and Marvel at BAM8! CouchWarriors always encourages DIY tournaments and to reward passionate champions of the game in the community. So if you want to see your game at BAM next year – step up and let us know! Battle Arena Melbourne 8 Afterparty! We’re happy to announce that the official BAM8 afterparty will happen on Sunday night May 15 at 10PM-3AM at the Crafty Squire nearby on 127 Russell Street. We will have drinks till late together with multiple setups there for your drunken team matches or moneymatches! The kitchen will be open till late with the likes of: fish & chips, beef burger, chips, wedges, calamari, pork belly, school prawns, lamb ribs, sweetcorn fritters. In addition, we’ll have our own Deejay: the infamous arcade Ryu player himself Phil “Def-P” Nguyen– feel free to hit him up with some requests. Heads up to anybody in Hobart, or who’s available to go, Area 52 is proud to present Tassie Fighter Con! A two day event with cash prizing, BBQ and drinking (after 5pm) Tassie Fighter Con will be held over the weekend of the 23rd and 24th of April at 104 Elizabeth Street, Hobart. 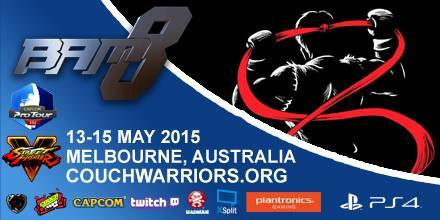 In you’re in the area and love fighting games be sure to check their Facebook event page!